For several years now, Gian Wild has been monitoring and assessing the accessibility of the four biggest (Western) social networks – Facebook, YouTube, Twitter and LinkedIn – to users with disabilities. This has been reflected in a series of articles and presentations tracking the changes over the years. In the second of her three CSUN presentations this year, Gian delivers an analysis of what each of the social media giants has done to address known issues and improve access. But before the statistics, the analyses, the comparisons, improvements and frustrations – it’s worth considering just why all this matters. Why is social media so important for people with disabilities? Certainly, on one level it’s a matter of ethical equality and non-discrimination, and on another it’s about compliance with the law and the threat of litigation – but it’s also something more than either of those things. Since the advent of each of these global social media channels, and the proliferation of the personal, mobile, internet-enabled device, social media has had a massive impact on how we communicate with each other – and a profoundly empowering effect for people with a range of disabilities. It’s probably more correct to say “profoundly empowering POTENTIAL”, because the real effect has been distinctly muted by accessibility issues. Let’s look at the reasons behind social media use, drawn from some of Gian’s CSUN presentation slides, and put these in perspective. Personal: examples include creating online commentary of personal thoughts, sharing photos and discussing social events. Work: examples include creating a résumé, creating professional connections and discussing job opportunities. Entertainment: examples include sharing videos, following discussion from celebrities, discussing strategies in online games. Provision of goods and services: examples include sharing information about a product, responding to user feedback about a product, accessing government services. 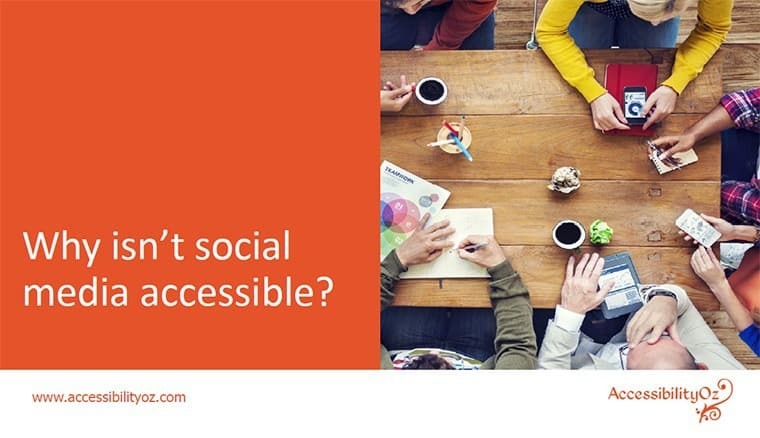 Each of these areas of activity is made more usable, accessible and convenient to people with disabilities by using social media than would otherwise even be possible, in many cases. But that only works if the social media outlets themselves are accessible. Can you imagine the frustration of finding a tool, an app, a website that helps you look for a job – only to find you can’t move around the webpage, or submit a simple form, or understand the order of the text? The very tool that will empower you beyond your disability is made inaccessible to you. These social media outlets were not crafted as agents of empowerment for people with disabilities, it’s true, but the fact is that they are at least as useful, necessary and expected to people with disabilities as they are to the entire community – and in many cases, more so – and they have legal as well as ethical obligations. So, how do Facebook, YouTube, Twitter and LinkedIn stack up in the accessibility stakes in 2018? And how can they – and we – address the issues that remain? If you’re at CSUN, come along to Gian’s information session for the answers and to dig deeper into Social Media and Accessibility.